Ever since moving into our home two years ago, we have been slow to decorate. It is not that we don’t want to. 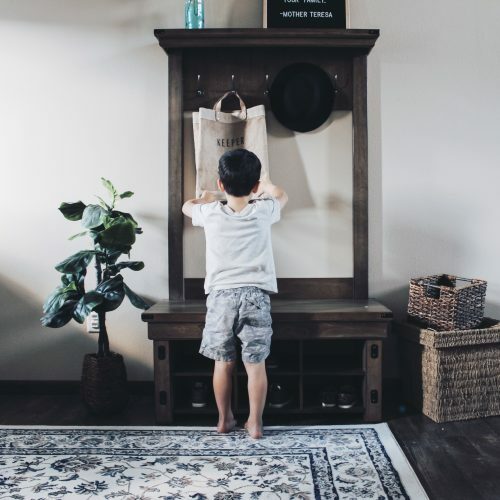 After years of filling a starter home with hand me downs, we now want to be intentional. Building a new house felt like such a fresh start. We brought over very little furniture and décor we already owned. In reality, most of it was used or poor quality to begin with. So, aside from the nursery furniture and an entertainment stand, we started from scratch. What I didn’t realize when we moved in is how big and daunting all of those fresh, blank walls could be! 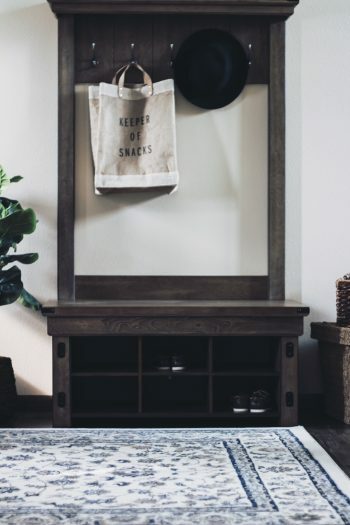 I had dreams of it being furnished from day one, but decorating our small entryway took a back seat. 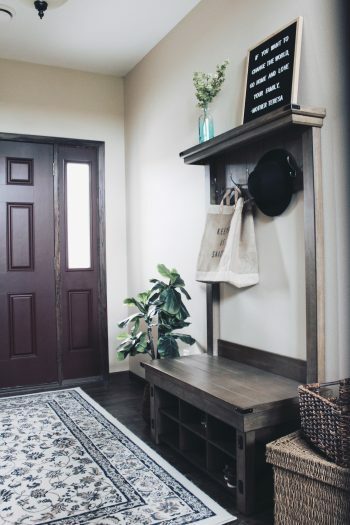 I actually purchased and tried out a few pieces for our entryway that I ultimately ended up returning. 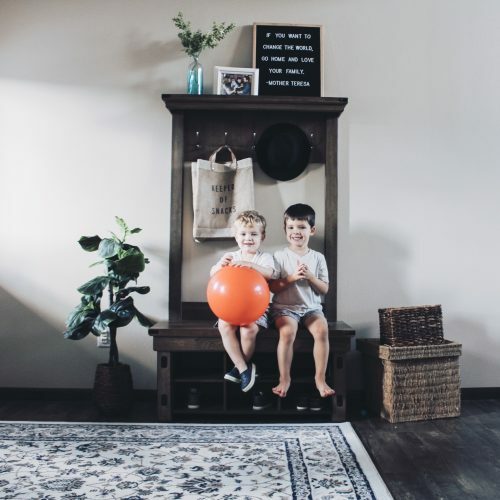 We do not want to decorate this house just for the sake of filling the space. I have searched high and low for a piece to compliment our small but cozy space. I went back and forth on if we needed a bench or a table. After two years of searching, I had the same feeling seeing this bench as when I walked our land the first time. It was meant to be ours! The piece arrived and required assembly, but Mike was able to get it put together relatively easily, while I chaperoned the boys (read: did everything in my power to keep them from trying to help!) It fit the space as I imagined it would, absolutely perfectly! Of course, as soon as it was up my first order of business was figuring out how to decorate it! 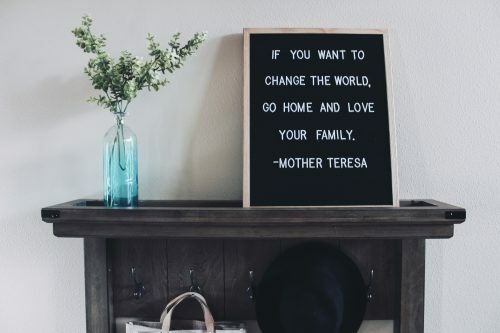 I have used my letterboard so many times over the past year, and for a long time it hung in our kitchen. But it never felt quite right where it was placed. 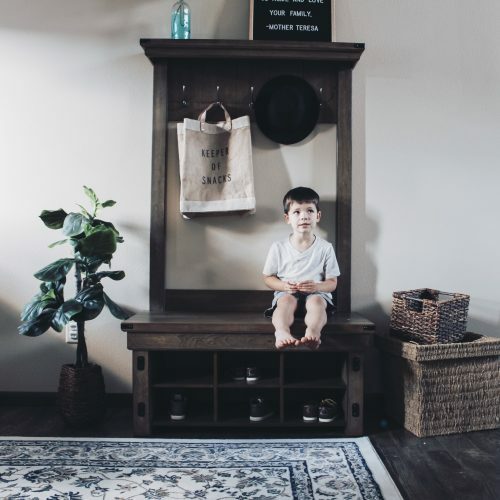 Once Mike had the bench assembled, it was like a light bulb went off. 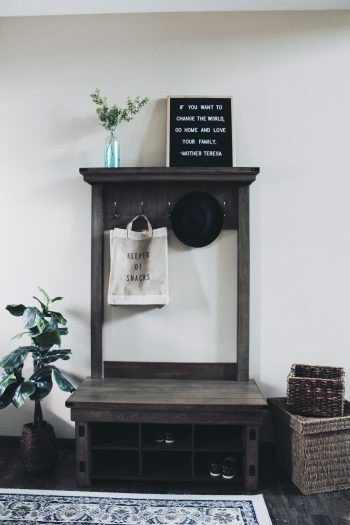 I quickly grabbed my letterboard and placed it on the top shelf of the bench, and knew immediately it had found its place. I plan to add one or two more family photos soon to complete the shelf space! Also, how dreamy would some twinkle lights and garland look up there once Christmas arrives!? I am already plotting the ways to use this shelf to add another festive nook during the holidays! While we have every intention of using the coat hooks when we have guests, in reality they won’t be used that often. 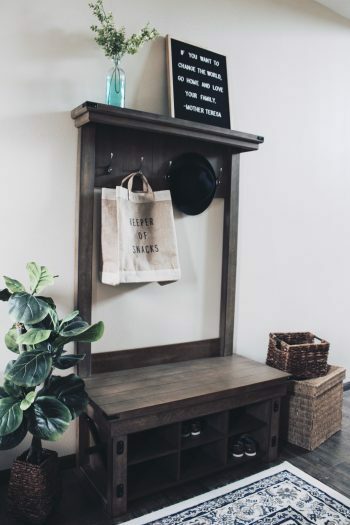 I had so much fun adding a cute hat and decorative bag to make the hooks look less bare and more homey. I love being able to use them for decorations. The items can easily be taken down whenever we host guests, but add so much the other 360 days of the year! One of the best and WORST things about building our home was starting from scratch. There is something very liberating about getting rid of the old and not bringing it with. It is also very challenging to look at clean, blank rooms and image how to fill them. We have some walls that I am still afraid to put anything on. I am afraid I will put a nail in the wall and regret it! My biggest piece of advice when starting fresh is to not rush the process. We plan to stay in this home forever. Eventually, I am sure we won’t have a place to put new things. For now, while I sometimes wish every last nook and cranny was decorated, I also am enjoying the clean feeling. I love knowing we only have things that we need. In our old house, many items felt like junk. It is better to invest in a few quality items than a dozen trinkets you will throw out a year from now. Like I said above, I tried more than one piece in our small entryway before getting it right. We really had to narrow down which spot we wanted our focal item. We also had to determine what type of piece made the most sense. I cannot tell you how many times we went back and forth between a bench and a table. This tree bench ended up feeling like the perfect compromise, giving us the best of both worlds. My piece of advice is to determine what your main goal is with a piece of furniture. 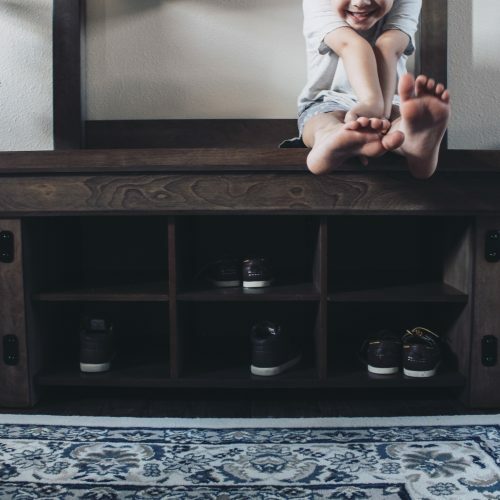 Do you want a place to put pictures and decorations? Does it need to be more of a functional space? Really take the time to determine how you imagine the space being used, and go from there! While it may be difficult, I really suggest not buying accent pieces or decor until AFTER you have your main piece selected! This was so hard for me, especially while we were in our old home. I constantly wanted to bring home cute little decorations, and my husband would discourage it. We knew we were going to move, and he told me more than once ‘you have no idea how that will fit in the new house’. While I hate to admit defeat, he was right. I have random items that I still cannot find an appropriate place for in our new house! 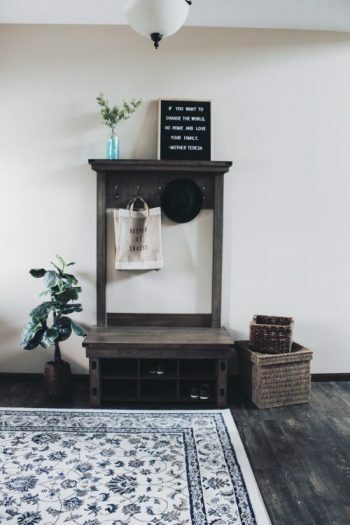 While that cute Welcome Home sign may seem adorable and perfect, if you don’t know what furniture you will have, you cannot know if it will fit in how you imagined. What are the ways you furnish your home? Do you go all out, or do you take your time? Leave a comment below sharing your thoughts! I am a Minnesota fashion and lifestyle blogger. Here you will find affordable, tall friendly styles and the best places to shop! Some posts may contain affiliate links. These links provide me a small commission when clicked, at no cost to you. All links are to products that I own or would purchase myself. 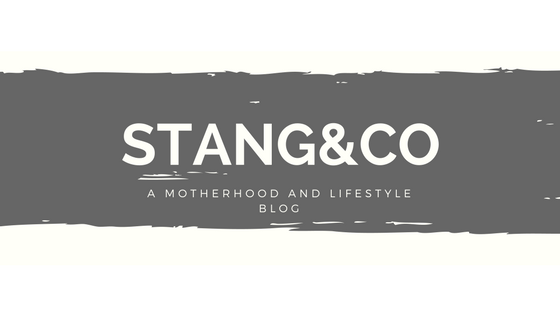 I strive to promote consistent, honest products, and appreciate support from my readers who make this blog possible.